An Example -- This is the synthetic example used in Jolivet & Simons (2018). Active faults accomodate the relative motion of tectonic plates. 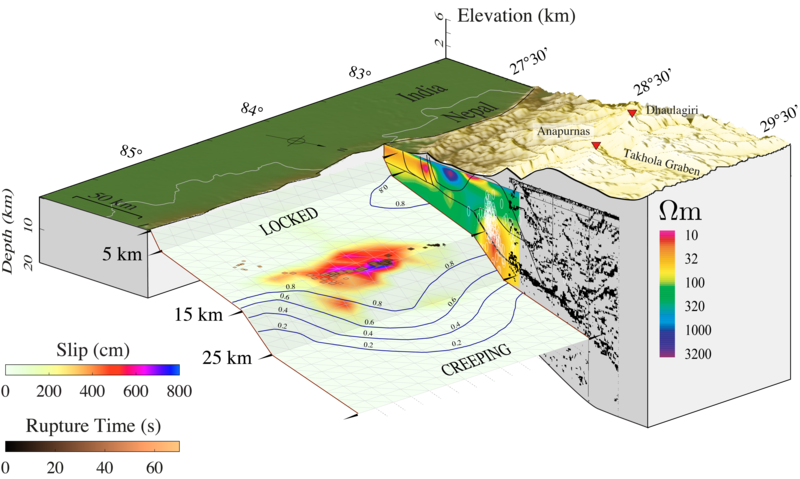 The classic view is that most active faults are locked, accumulating stress and releasing it during earthquakes. Geodetic observations over the last 50 years have shown this picture is oversimplified. Some faults slip aseismically continuously releasing stress. Some faults experiences slow slip events. Some faults see periodic variations of aseismic slip rates. A wide variety of modes of slip have been discovered using triangulation methods, creepmeters, offseted markers and more recently GPS and InSAR data. What are the relationships between slow and rapid slip (i.e. between silent slip and earthquakes)? 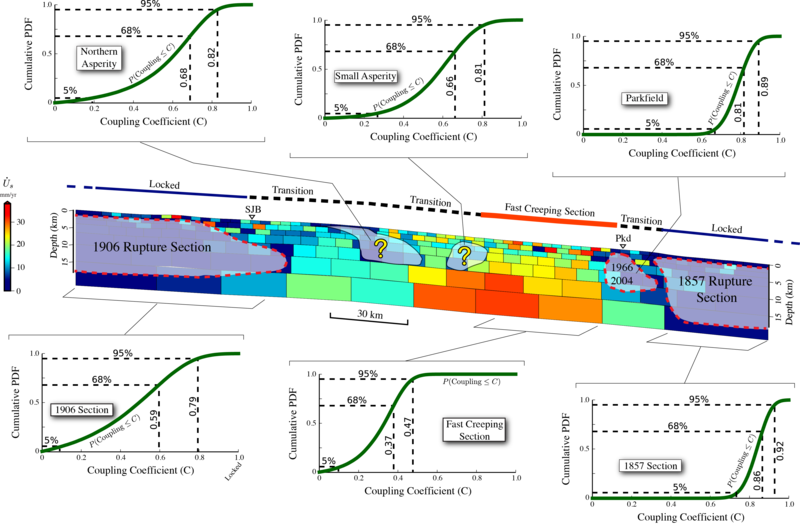 What is the influence of slow and rapid slip on long term processes? What is (are) the physical model(s) underlying these different modes of slip? 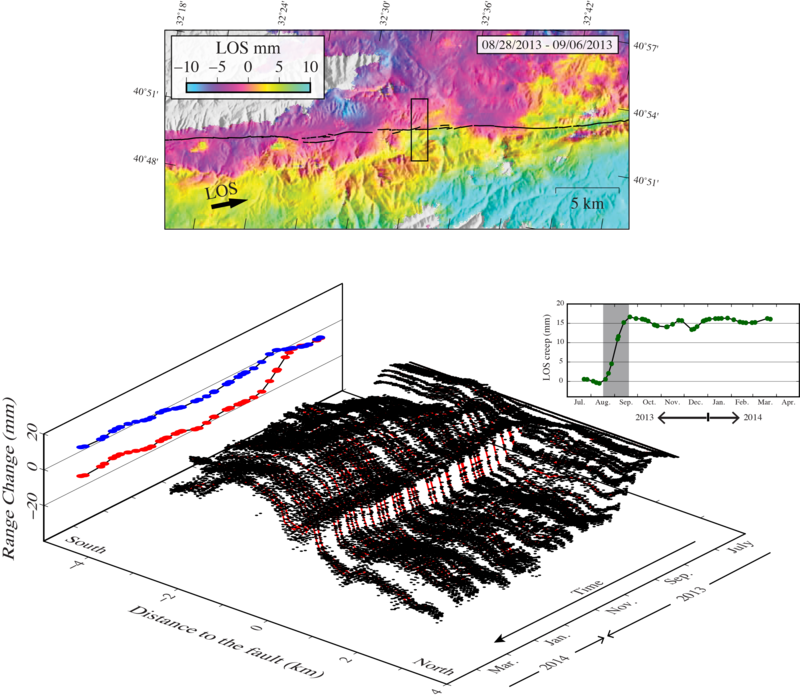 I use space-based geodetic methods to capture, characterize and model all styles of fault slip, toward a better understanding of the behavior of active faults. Interferometric Synthetic Aperure Radar is a space-based technique allowing to derive images of ground deformation. This method is based on repeated acquisitions by a Radar system onboard a satellite. 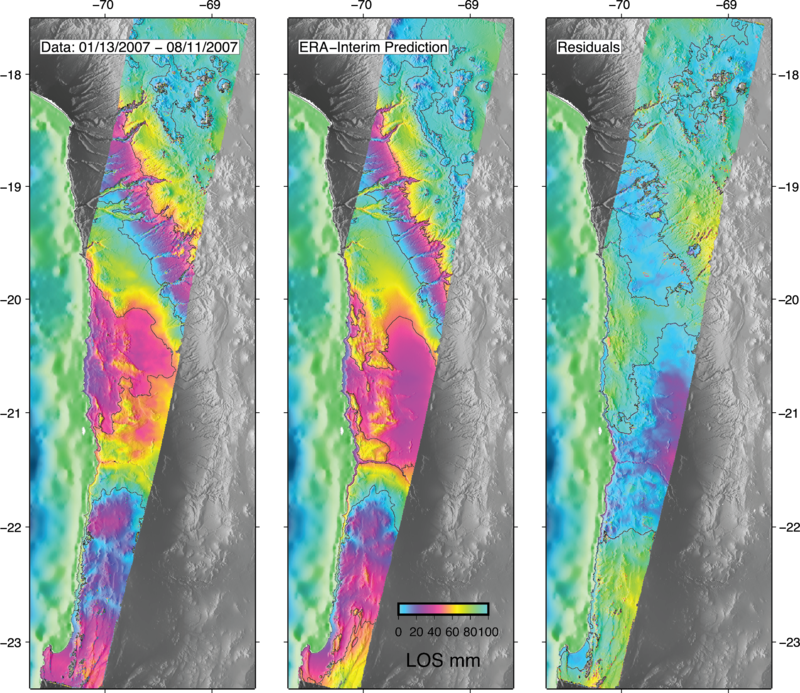 The interferogram combining two images of the ground is a function of all sources of change in travel time of the Radar wave through the atmosphere, including deformation and atmospheric variations in temperature, pressure and water vapor. My goal is to derive the best images and time series of images of the deformation of the ground as possible. To do so, I develop new time series analysis methods to reconstruct the history of ground motion from Radar images. I also work on the correction of atmospheric perturbations, modeling atmospheric delays using Global Atmospheric Models. In various fields of Earth Sciences, one needs to extract information from data to constrain a model. This process is often realized by solving an inverse problem. Many methods exist to find the "best fit" model, the one that reproduces best our data. However, in order to derive accurate uncertainties on our explanation of natural processes and in order to know where, when and why some parts of our models are not constrained, Bayesian inference is used. I take part in the development of a solver for large dimension inverse problems (PI: M. Simons, Caltech, coll: Z. Duputel, Strasbourg). Instead of finding the only best model, we explore the whole space of possible models to derive probability density functions of models, propagating the information content from our geodetic and seismic data to the distribution of slip on active fault. I particularly apply these methods on active faults over the interseismic period, to derive fault locking and aseismic fault slip.